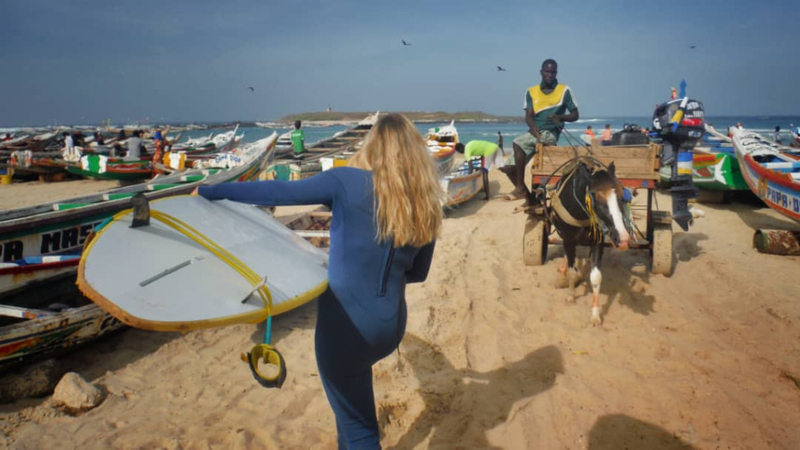 Our Surf School MALIKA SURF CAMP in Dakar is located at the beach of Yoff BCEAO, just behind the Centre Aerée, face to the Mare.aura.yoga shala. The spot of Yoff is a huge beachbreak perfect for learning how to surf thanks to the many picks and small rips. 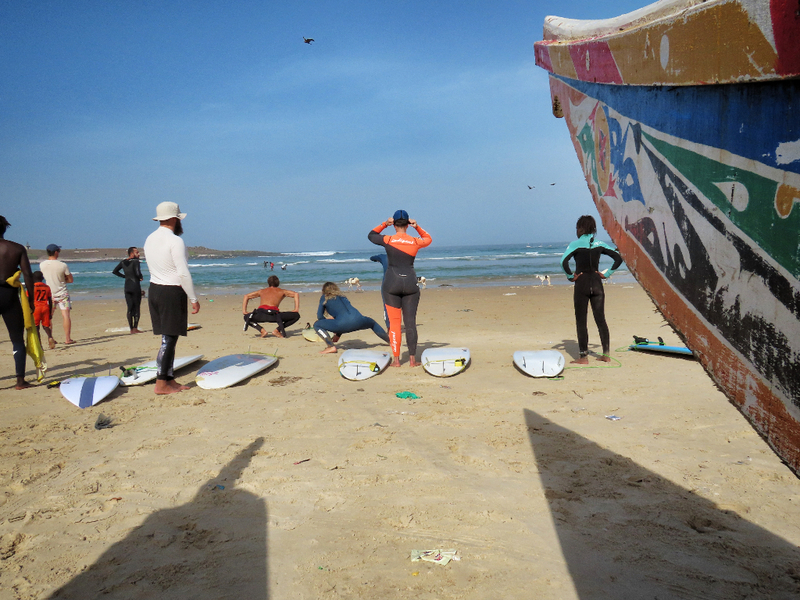 Marta and Aziz are surf teachers with an ISA (International Surfing Association) coaching diploma and their local surf teachers already have years of coaching experience and are able to teach in both French and English. After a theory session on the sand you will head into the water to practice what you learnt. Step by step we will help you ride your fist wave and have loads of fun! 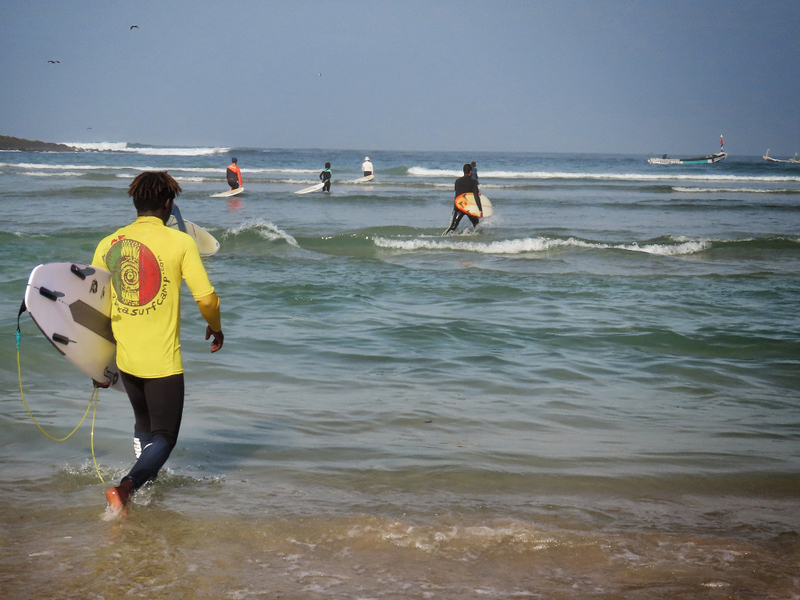 Our surf classes are open also to external students who are in Dakar and want to join our community. Ratio students:teacher = 4:1 for adults, 2:1 for children. GREEN WAVES in partnership with My Green Trip. 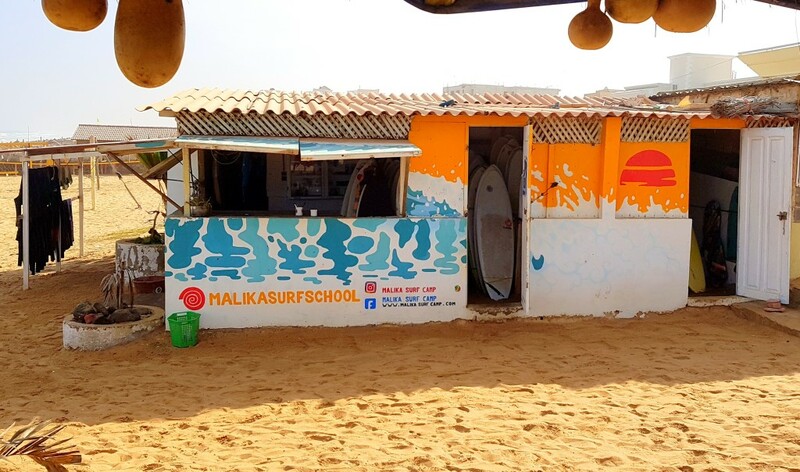 Malika Surf Camp is more than catching green waves. 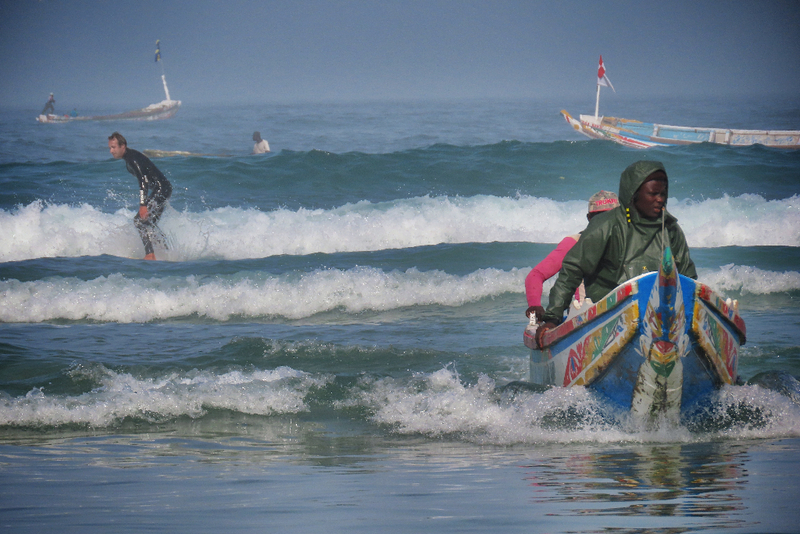 As surfers it’s on our responsibility to take care of our beaches and ecosystem. To join our GREEN WAVES surf classes and know the surf program for the week, give us your email and you’ll be added to our mailing list. 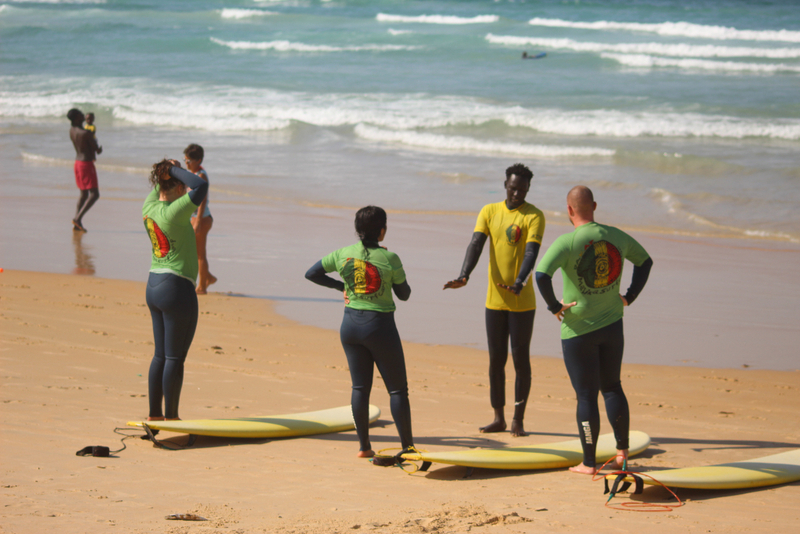 The pictures of the week end classes are posted every Wednesday in our fb page: “Senegal Surf Camp“, check it out! 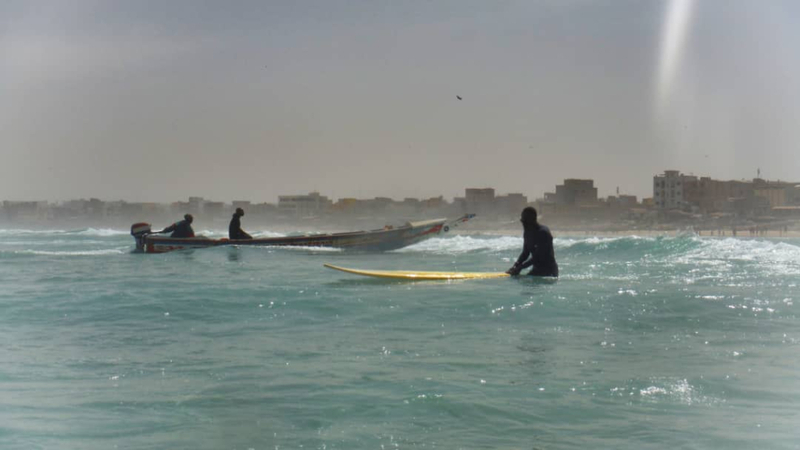 Advanced The time changes according to wave direction and tide as the class is held around Ngor, Secret, Baye des Carpes and Vivier. The groups are always split into the level of surfing. The price includes the surf equipment. Groups are always split by surfing level and age. The price includes surfing equipment. A good surf session at the beach after a long day spent in front of the computer at work. One hour in the sea on a surfboard at sunset is a perfect deal! The price includes 1 hour of surf class and surf equipment. The classes are guaranteed with minimum 3 students. The class starts at 6.30 pm until 7.30 pm.